The Robots Are Coming: Will a Guaranteed Minimum Income Help? Home News The Robots Are Coming: Will a Guaranteed Minimum Income Help? Read details about the early experiments. The American workplace is rapidly changing. Many low-skilled jobs have already been replaced by technology, and continued automation and artificial intelligence might put more people out of work. Higher-skilled careers in areas such as finance and medicine might also be at risk. These workers often struggle to find new employment. 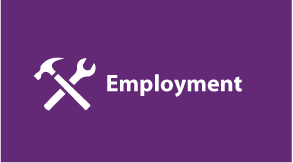 In response, policymakers are debating the necessary educational paths to give the current and future workforce the skills they will need to secure meaningful employment. At the same time, interest in the concept of a guaranteed minimum income is growing domestically and globally. Under this policy, a government guarantees that people earning below a certain amount have an income sufficient to live on, provided they meet certain conditions. What many people don’t realize is that the United States was a pioneer of this concept, known here as a negative income tax (NIT). Mathematica Policy Research was created to conduct the first social policy research of this program. For the first time, we have digitized these rigorous, comprehensive resources to help inform pilots and discussions taking place around the world—for example, in Brazil, Canada, Finland, France, Kenya, India, Liberia, the Netherlands, and Uganda—about the concept of a guaranteed basic income. In the United States, Silicon Valley entrepreneurs such as Elon Musk, a founder of SpaceX and Tesla Motors, have supported the basic income concept. And Facebook cofounder Chris Hughes’ Economic Security Project is investing $10 million in related projects. Venture capitalist Sam Altman of Y Combinator is funding a basic income pilot in Oakland, California. Finally, Robert Reich, former Secretary of Labor, and former President Barack Obama have weighed in on the idea of bringing back some form of the basic income concept in the next 10 to 20 years. Mathematica’s original NIT studies, still the most comprehensive evaluations of the model to date, can help inform current efforts. Read Mathematica President and CEO Paul Decker’s blog on the NIT experiments and their relevance to recent initiatives. For additional studies and public use data files, see the Negative Income Tax Experiments Archive at the University of Wisconsin’s Institute for Research on Poverty and read the article in the Concise Encyclopedia of Economics. Carcagno, George J., and Walter S. Corson. “The Impact of a Negative Income tax on AFDC Recipients and State Welfare Expenditures.” Princeton, NJ: Mathematica Policy Research, February 1976. Carr, Timothy J. “The Effect of Local Labor Market Conditions on the Labor Supply Response to a Negative Income Tax.” Princeton, NJ: Mathematica Policy Research, November 1980. Fair, Jerilyn. “Estimating the Administrative Costs of a National Income Maintenance Program.” Princeton, NJ: Mathematica Policy Research, May 1971. Fair, Jerilyn, and Anne Freeman. “The New Jersey/Pennsylvania Graduated Work Incentive Experiment Tax Rebate System.” Princeton, NJ: Mathematica Policy Research, 1971. Garfinkel, Irv. “The Effect of Welfare on the Labor Supply Response on the Urban Graduated Work Incentives Experiment.” Princeton, NJ: Mathematica Policy Research, n.d.
Horner, David. “The Impact of Negative Taxes on the Labor Supply of Low Income Male Family Heads: Evidence from the Graduated Work Incentive Experiment.” Princeton, NJ: Mathematica Policy Research, April 1973. Kershaw, David, and Jerilyn Fair. The New Jersey Income Maintenance Experiment. Volume 1. Operations, Surveys, and Administration. New York: Academic Press, 1976. Kershaw, David N. “The Negative Income Tax Experiment in New Jersey: General Discussion.” Princeton, NJ: Mathematica Policy Research, April 1969. Kershaw, David N. “A Negative Income Tax Experiment.” Scientific American, vol. 227, no. 4, October 30, 1972, pp. 19–25. Kershaw, David N., and Felicity Skidmore. “The New Jersey Graduated Work Incentive Experiment.” Princeton, NJ: Mathematica Policy Research, July 1974. Maxfield, Myles, Jr. “Program Cost, Adequacy of Support, and Induced Labor Supply Reduction of a Negative Income Tax.” Princeton, NJ: Mathematica Policy Research, January 1978. Moffitt, Robert A., and Kenneth C. Kehrer. “Estimating Labor Supply Disincentives of a Negative Income Tax: Some Results and Lessons from the Experiments.” Princeton, NJ: Mathematica Policy Research, December 1978. Ross, Heather. “An Experimental Study of the Negative Income Tax.” Princeton, NJ: Mathematica Policy Research, May 1968. Mathematica Policy Research. “Procedures Manual for the New Jersey/Pennsylvania Negative Income Tax Experiment. Volume 1.” Princeton, NJ: Mathematica Policy Research, February 1971. Mathematica Policy Research. “Procedures Manual for the New Jersey/Pennsylvania Negative Income Tax Experiment. Volume 2. Appendices” Princeton, NJ: Mathematica Policy Research, February 1971. U.S. Department of Health, Education, and Welfare, Mathematica Policy Research, and Institute for Research on Poverty. “Summary Report: New Jersey Graduated Work Incentive Experiment.” Washington, DC: Office of Economic Opportunity, December 1973. Watts, Harold W., and Albert Rees. The New Jersey Income Maintenance Experiment. Volume 2. Labor-Supply Responses. New York: Academic Press, 1977. Watts, Harold W., and Albert Rees. The New Jersey Income Maintenance Experiment. Volume 3. Expenditures, Health, and Social Behavior; and the Quality of the Evidence. New York: Academic Press, 1977. Kehrer, Kenneth C., John F. McDonald, and Robert A. Moffitt. “Final Report of the Gary Income Maintenance Experiment: Labor Supply.” Princeton, NJ: Mathematica Policy Research, 1979. Kehrer, Kenneth C. “Findings from the Gary Income Maintenance Experiment.” Princeton, NJ: Mathematica Policy Research, October 1977. Kehrer, Kenneth C., and Stanley P. Stephenson, Jr. “The Gary Experiment in Welfare Reform.” Princeton, NJ: Mathematica Policy Research, November 1977. Tidwell, Billy J. 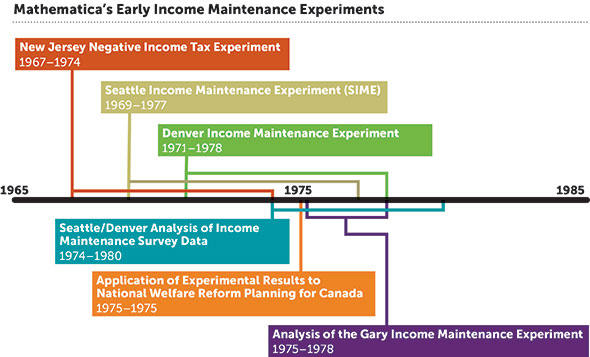 “Gary Income Maintenance Experiment. Income Maintenance and the Utilization of Social Service Agencies.” Princeton, NJ: Mathematica Policy Research, October 1977. Christopherson, Gary. “The Administration of the Seattle and Denver Income Maintenance Experiments.” Princeton, NJ: Mathematica Policy Research, December 1976. Flanders, Linda Drazga, Barbara Devaney, Margaret Grady, and Manika Sukhatme. “Employment Issues for Low-Income Women: Values and Choices.” Princeton, NJ: Mathematica Policy Research, May 1978. Manheim, Larry M., and Mary Ellen Minchella. “The Effects of Income Maintenance on the School Performance of Children: Results from the Seattle and Denver Experiments.” Princeton, NJ: Mathematica Policy Research, September 1978. Stanford Research Institute and Mathematica Policy Research. “The Seattle-Denver Income Maintenance Experiment: Mid-Experimental Labor Supply Results and a Generalization to the National Population. Summary Report.” Princeton, NJ: Mathematica Policy Research, February 1978. U.S. Department of Health and Human Services. "Overview of the Final Report of the Seattle-Denver Income Maintenance Experiment." Washington, DC: U.S. Department of Health and Human Services, May 1983. Reviews the basic findings of the negative income tax experiments and discusses the modeling differences encountered in estimating the labor supply response to tax rates. Estimates the trade-offs between the goal of raising the incomes of the poorest families, the goal of promoting the private employment of poor people, and the budgetary cost of replacing AFDC and Food Stamps with a universal negative income tax nationwide.